Here in Colorado we are spoiled by temperate conditions along the Front Range, allowing for great riding almost year round; however we do get challenging weather from time to time and winters can be rough and present a number of obstacles. That being said, the benefits of winter riding are plentiful and can be quite enjoyable. Following are our tips to winter riding. Stay warm! It’s a no brainer. If you are warm and comfortable while riding, then you will enjoy your ride. So, take inventory of the cycling apparel you currently have and purchase additional items that are missing from your cycling wardrobe. If you’re not sure about what items you need, you might find our post, Winter Cycling: How to Enjoy It with Winter Layering Basics, to be helpful for ideas. Another option is to check out on our video. It’s a great resource outlining when to add certain layers at certain temperatures. Take care of your bike! Winter riding poses many threats so having a bike in good working order keeps you safe, warmer, and provides the opportunity for a more enjoyable ride. Besides, a good ride always does the body and mind good! Our post, 5 Things You Should Know To Winter Proof Your Bike, illustrates the essentials of keeping your bike in good riding form for the winter months. Aside from bike prep, you’ll want to pay attention to bike maintenance and bike parts. Winter riding conditions aren’t the greatest. To keep the integrity of your cycling accessories on track, you’ll want to read our post, Winterizing Your Bike: What’s In Your Tool Kit? Fuel your desire! Training in the colder months can be a chore. So, put some fun and adventure into your rides! One option it to try plus- size tires. Plus-size tires are a relatively new trend and they are gaining in popularity because the 3” tires handle snow really well but have a reasonable tire weight so you aren’t compromising speed performance. As a result, bikes with plus-size tires turn out to be an ideal all-season mountain bike and a purchase you won’t regret. The S-works Stumpjumper FSR Comp 6Fattie is our top-performing and most popular plus-size tired bike right now. If you really want to go big, ride a fat bike! 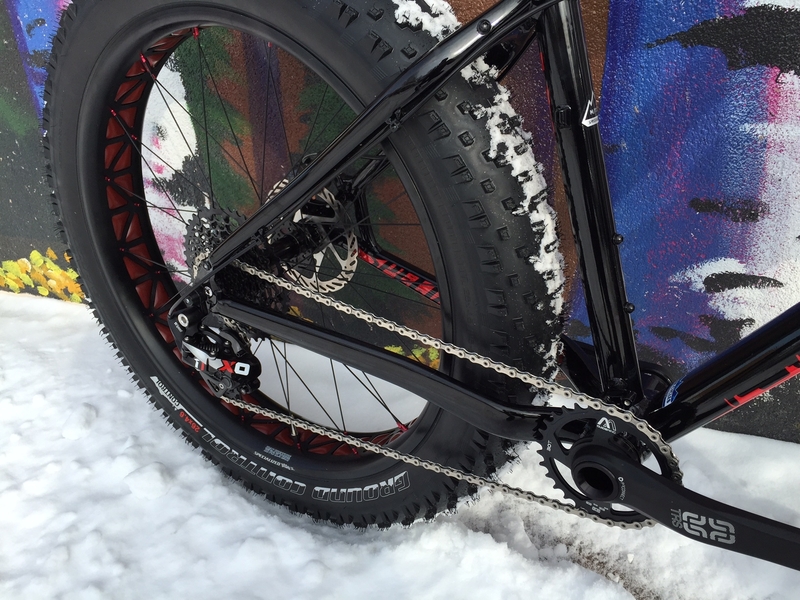 Fat bikes go where no bicycle has gone before. Fat bikes can ride pretty much anywhere. They do really well on dirt but they are also very capable in the snow. Packed snow will feel very much like riding on dirt. Discover the reasons to ride a fat bike in our post, Why Go Fat? Have no fear of losing motivation in the winter months! The first step towards successfully riding through the winter months is dressing appropriately and winter proofing your bike. When you are confident in your bike and clothing options, there are less excuses to tell yourself for not riding and more reasons to get on the bike and enjoy the ride.